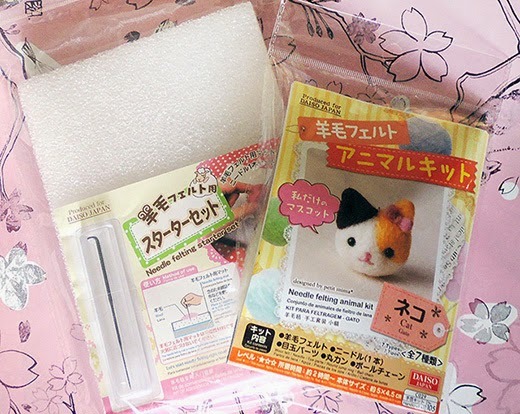 I haven't been DAISO ($1 value shop chain) for a while, and when I had a look of their "Handmade" section, I was really surprised that they have variety of beginners' DIY kits. 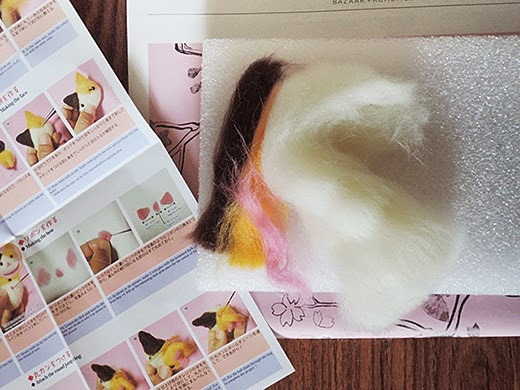 Tiny beading animals, faux leather miniatures, UV resin gel , paper weaving baskets, small needle felt / sheet felt plushies, and more. 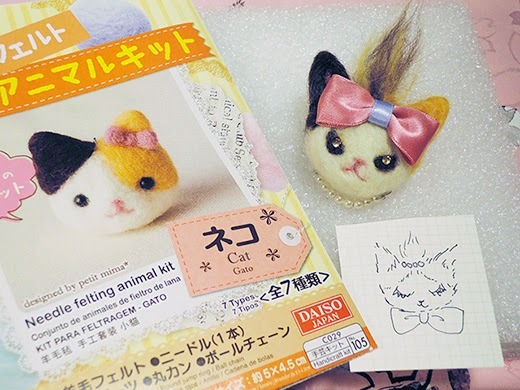 I'm interested in but never tried needle felt before, so I got DIY cat plushie kit (includes four colored wool felt, a needle, eye parts, round jump rings, a ball chain, fully illustrated JP/EN instruction) and "needle felt starter kit" (includes a needle felting mat and a needle for felting). 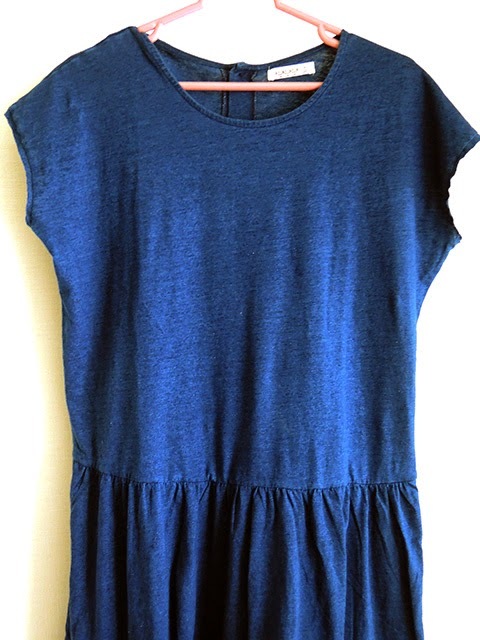 I got a long-sleeved denim-look-alike relaxing jersey dress on clearance sale. 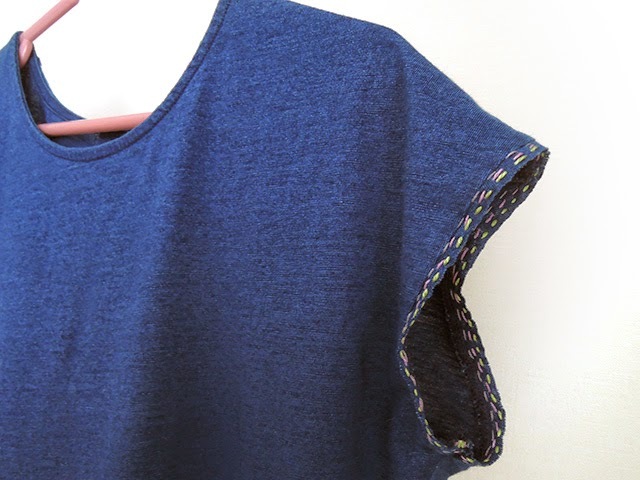 Early summer will come to Tokyo very soon, I'd like to cut-off the sleeves and put stitches for some decoration combined with stopping frays. As always says, I'm really BAD at sewing and stitching! So I decided to use most simple and basic running stitch for this. 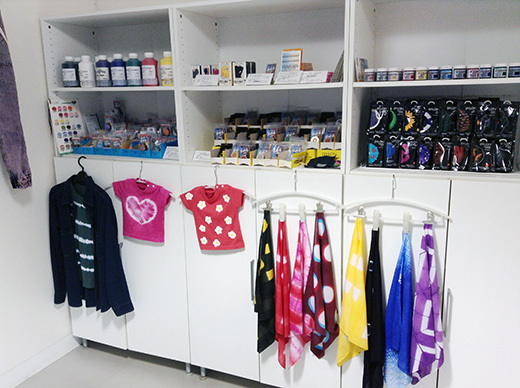 The most important thing is choosing lovely threads. 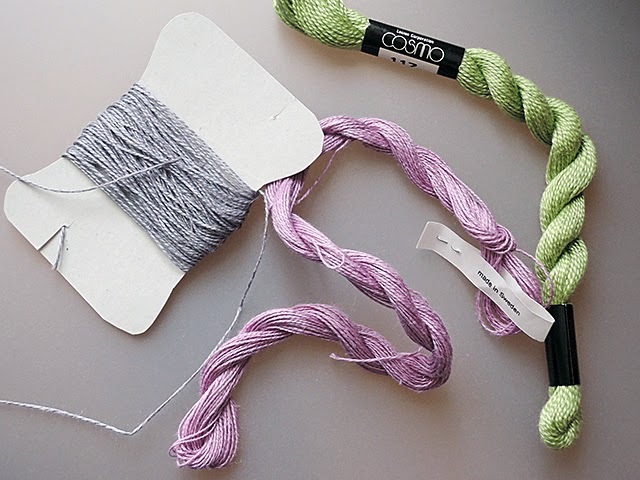 Choose different (or same) colors for each stitch. I use 3 different beautiful color Swedish linen threads. 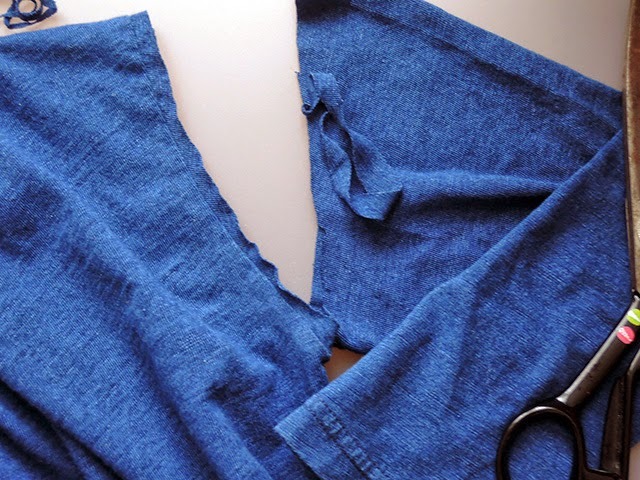 Cutoff the sleeves, leave sleeve fabric half or 1 inches from arm holes. Trim both sleeves (almost) same length. Start stitching. 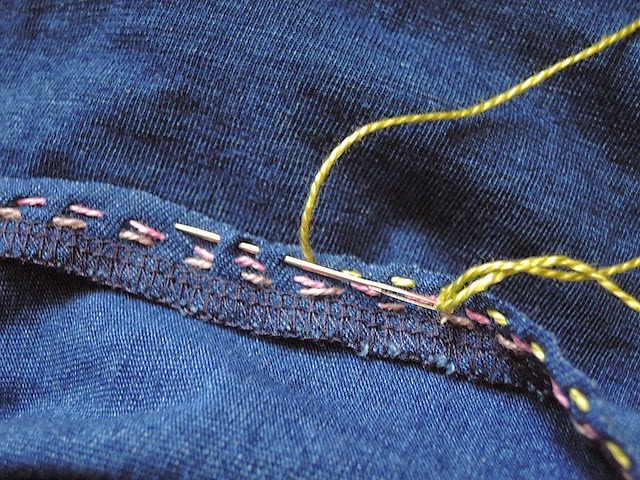 Tie up the thread, and start stitching from bottom of the sleeve. 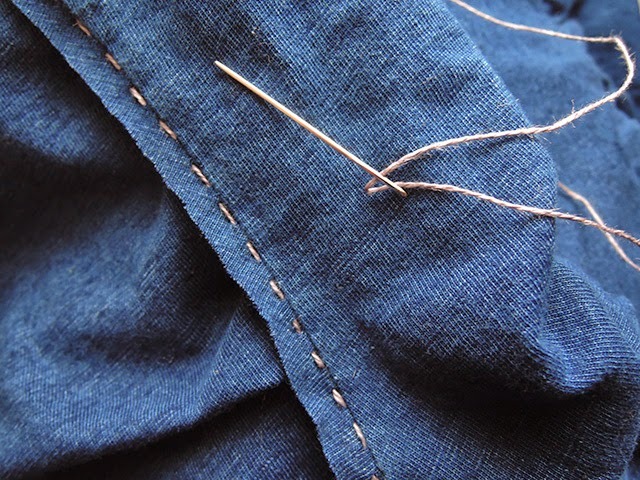 To hem cut-off sleeves, put one or two whipstitch for stopping frays. Then start running stitches. 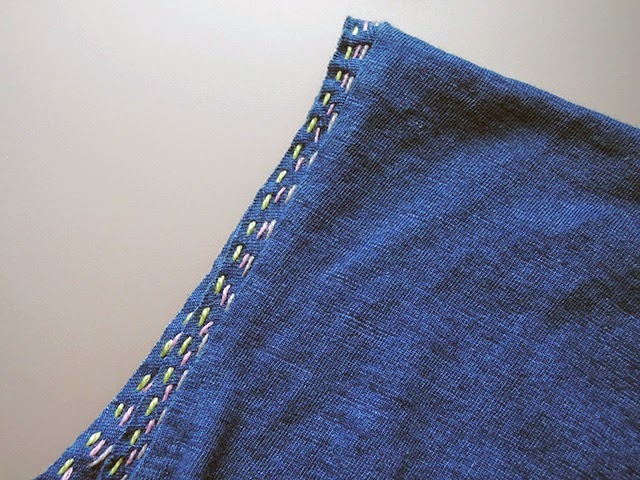 I put the first stitch line from inside of the sleeve. Keep stitching! 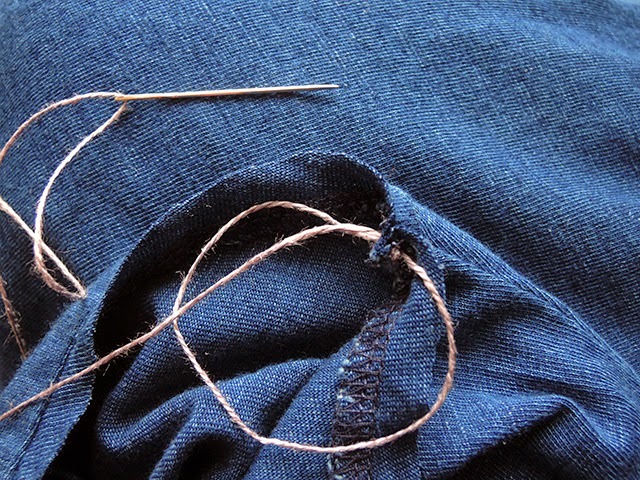 Don't pull the thread strongly, not to shrink dress fabric. And don't forget to tie up the end of the thread. 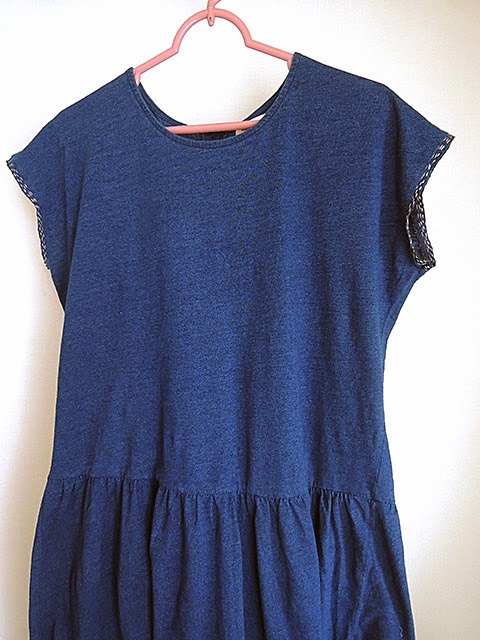 It's like Japanese traditional Sashiko technique, but more free-minded and easy. I got Tsumori's cute pink-beige "Neko-Dot" cashmere scarf last year. I do love it but the color was too similar to my face... to say the truth, it was not nice in me. I don't want to make it being put in the closet forever. An idea had came into my head...maybe I could change the color of it? At first I thought I'd dye it by myself. 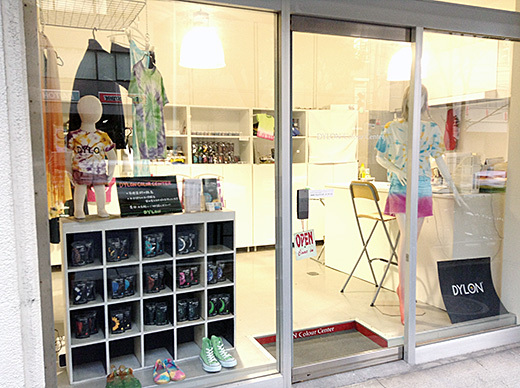 But then I found famous dye color company DYLON doing dyeing service in Shinsen (only 1 station from Shibuya). 2 weeks ago I went to DYLON COLOR CENTER and chose the color number 11 Bordeaux from "multi" series. Shop staff was professional of coloring and showed me some samples. 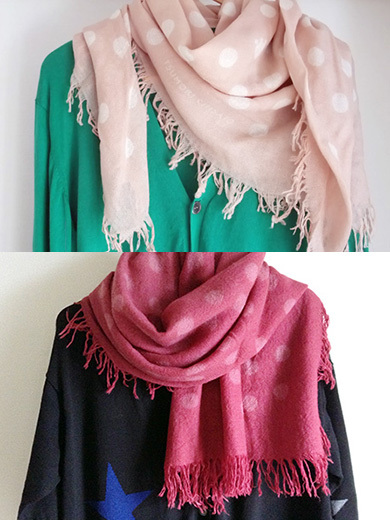 She said it can be softer color and remain cute dots of the scarf. The price depends on weight of the fabrics. 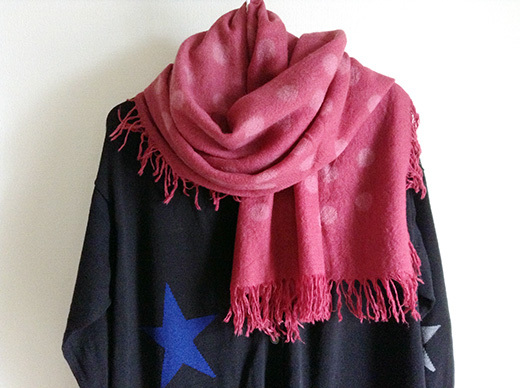 This scarf costs 3,000yen to dye. 10 days later they leave me a phone message - it was done. I went to the shop again and re-born coloring of the scarf made me happy! I can't wait the beautiful autumn day to put this on! Recently I got a cute iron-on-patch of my fav anime. I don't want to fix it to only one of my bag or t-shirt. 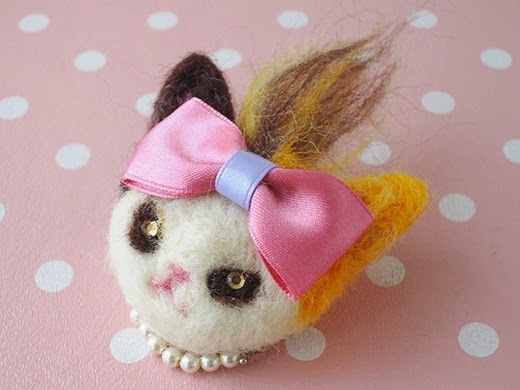 So I changed it to a brooch pin. It's quite easy! If you have skill of making your own patches (I envy you ;D) it would be awesome work! 1~2. Put a patch on a felt sheet. Cut the felt out with some allowances to the patch. If your patch is not iron-on type, glue the patch with fabric glue to the felt sheet and dry it. 3. (if your patch is iron-on type) Press the iron with steam on the patch to the felt sheet. Using presser cloth is better. 4. Cut the felt sheet out to contour shape of the patch. place the pin with small felt sheet piece for the mount. If you are more lazy and have super glue , you don't need the mount. 5~6. Put fabric glue to the contour of fixed patch and felt sheet with toothpick or tiny spatula. Dry it. 7~8. Attach the pin. Sew the pin to the mount and fix it by superglue on the back. Or just attach the pin to the back by superglue. 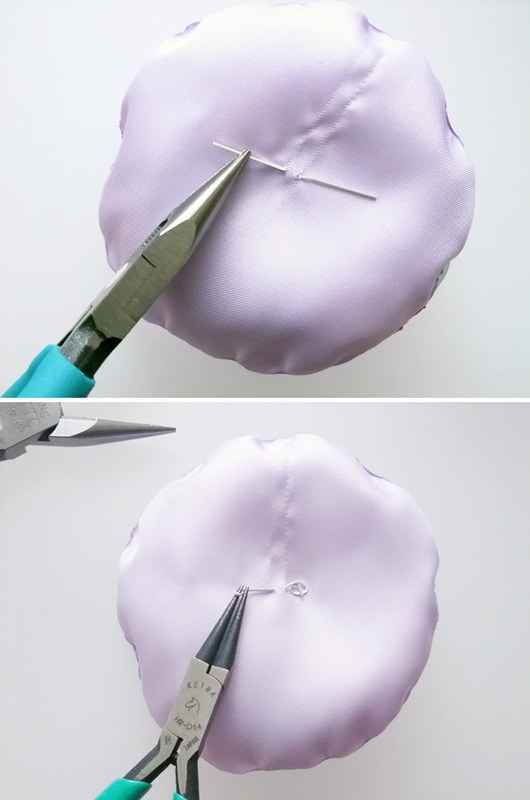 The technique of making petals are same as jellyfish. This time I use chemical satin and chiffon. Also these are very flammable! Please take care about that! Draw and cut 2 circles for each size on satin fabric. 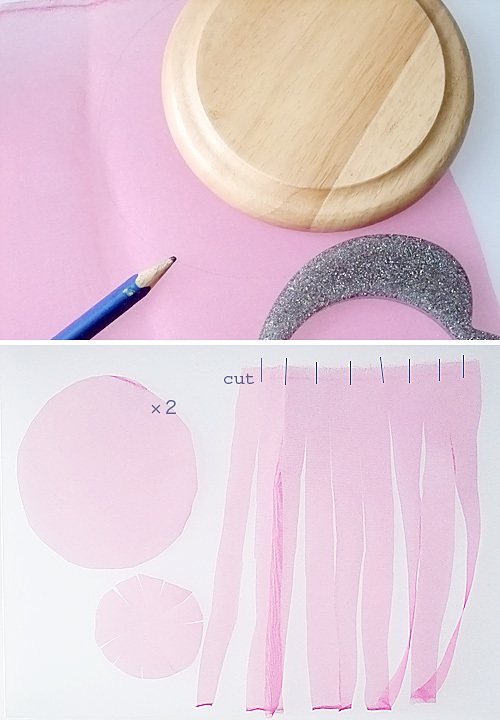 And draw and cut a circle each size on chiffon. You'll have 9 circle fabrics. 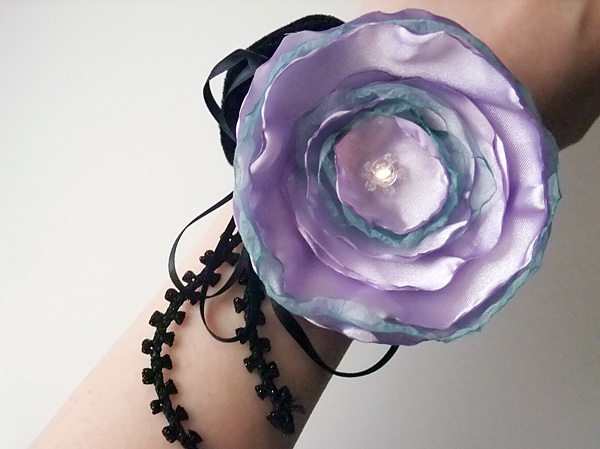 I'm using wood coaster (it become candle holder later), bracelet, and a flash-light. Whatever can make circles is ok.
Light a candle, and hold satin and chiffon circles on your hands to shrink by candle's heat. Please keep a safe distance from a candle always. 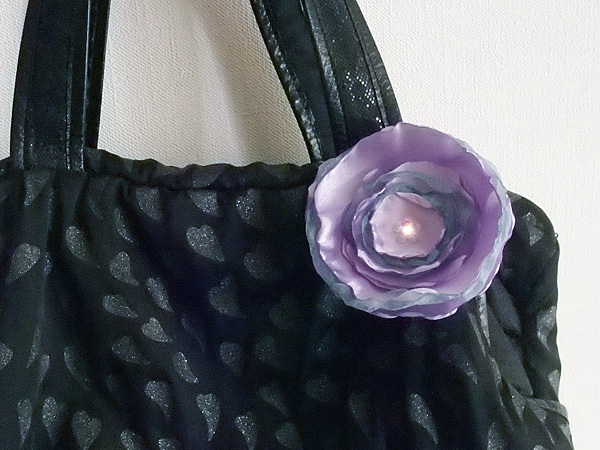 This fabric is easy to burn out! Design your flower petals. If you need smaller petal, keep heating it little longer and make it more shrink. Fun and lazy time to fixing petals. Stick petals one after another. Put LED legs down by pliers, angles of ninety degrees. Longer leg is + (positive electrode), shorter is - (negative electrode). If you think you'll forget which is which, write on petal back + and - by pencil. Then roll up each legs like small rings carefully. Now petals are fixed by LED legs. All the time, LED legs must not contact. Sew LED legs and battery box by regular needle and conductive thread. 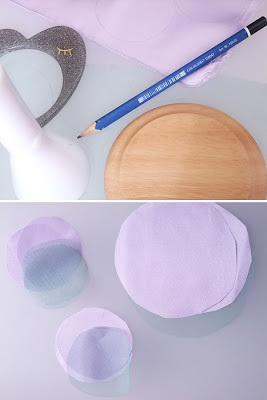 Cut a felt sheet round. Set battery box down center (later, brooch pin comes on upper place). Start sewing from LED + (positive electrode) leg. 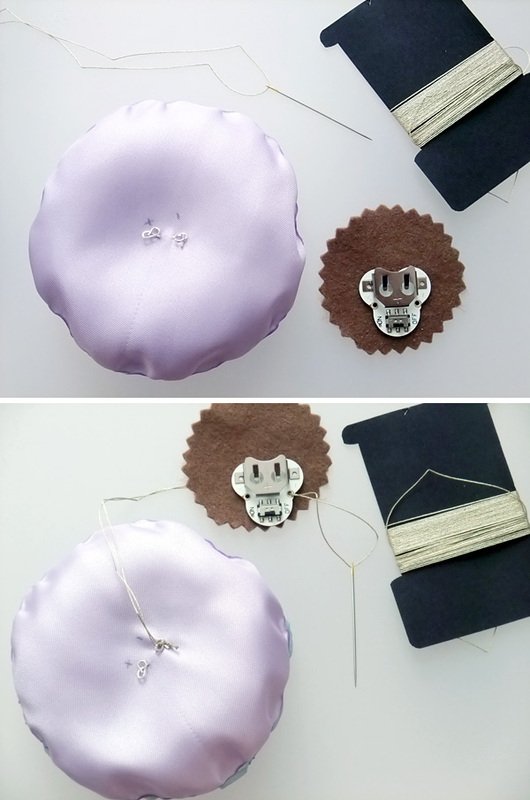 sew it 2 or 3 times, then sew battery box + (positive electrode) hole 2 or 3 times through felt sheet. Tie conductive thread, and cut short. And sew - (negative electrode) LED leg and battery hole by new thread. Never contact + and - electrodes! Test how it works. Put battery and switch on. Hem the felt sheet by regular needle and fisher line. Sew brooch pin on felt too. 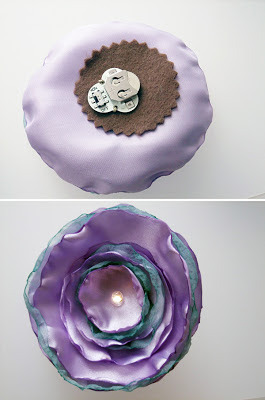 Turn it to front, then sew beads around LED head like stamens by beading needle and fisher line. 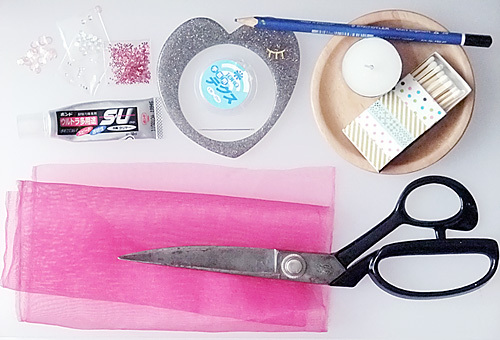 arrange it on scrunchie with some ribbons like a bracelet! 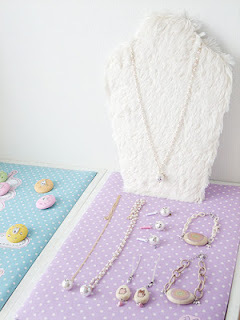 People asked me how to make jellyfish accessories when I blogged these on 8tokyo. And yes I'm lazy enough..., it was two years ago!! Sorry too late to share this. How to make them is very simple and easy, but slightly dangerous. Please make it carefully!! Chiffon fabrics "burn" well. and of course candle is hot! And please keep fresh air into your room while you're making. Draw and cut 2 bigger circles and 1 smaller circle. I'm using wood coaster (it become candle holder later), and a bracelet. And cut 1 square. And make slits to square one and smaller circle. 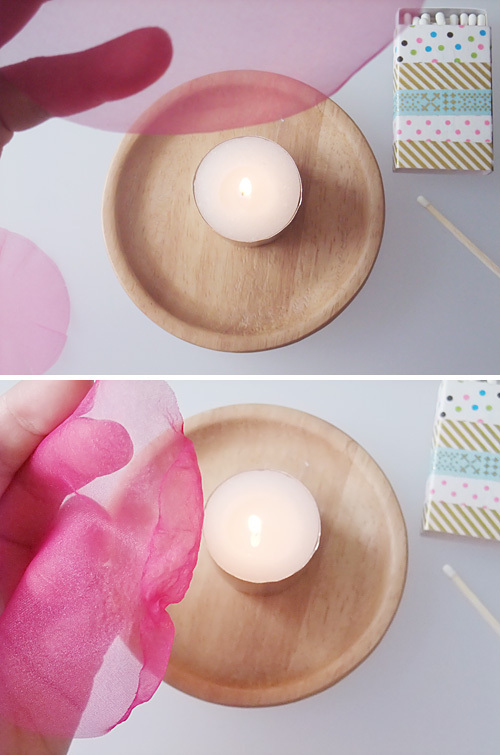 Light a candle, and hold chiffon on your hands to shrink by candle's heat. Please keep a safe distance always. This fabric is easy to burn out! Make it slowly. Roll up the square one, and sew the place no slits by fisher line. Then put the needle out from top, and sew all of jellyfish parts together. 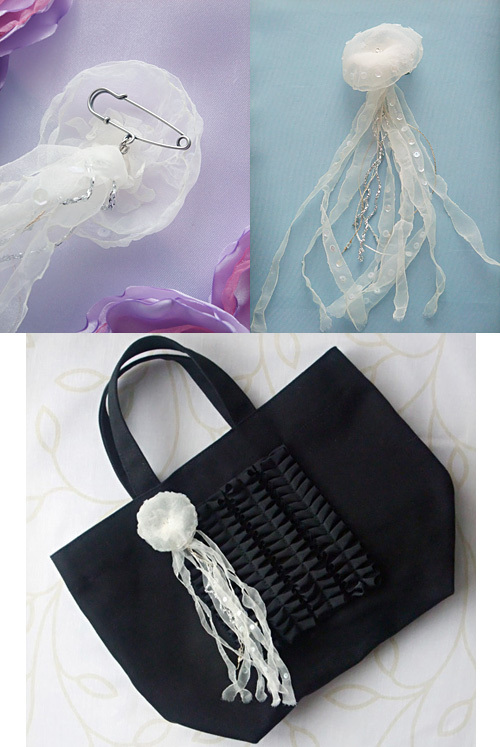 You need simple jellyfish? Congrats, finished! 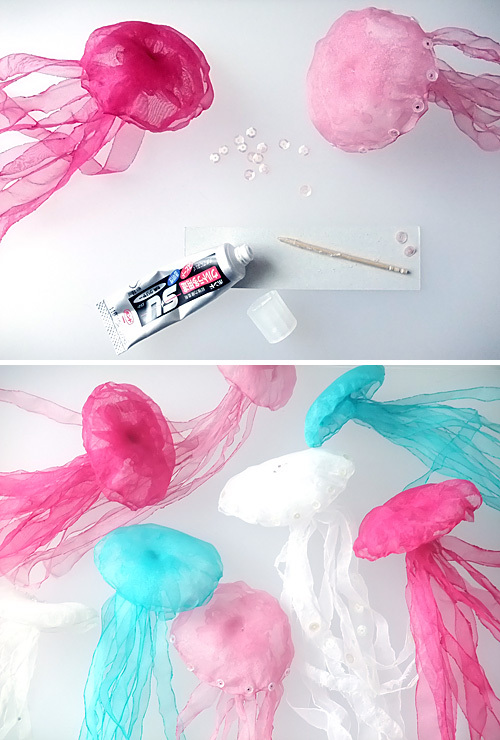 Decorate jellyfish with sequin, ribbon, rhinestone, tiny metals.. or more. 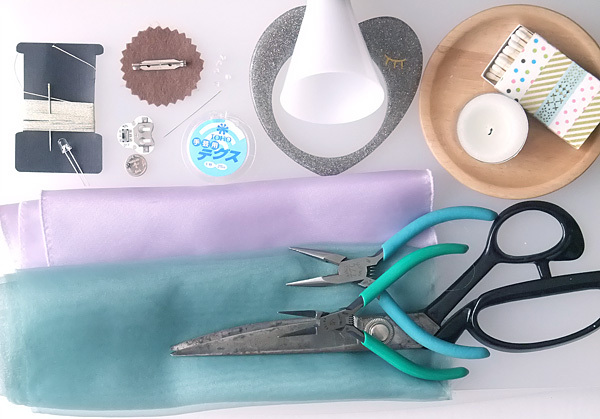 Also you can roll up ribbons or silk/metallic strings when you make axis. I wanted to get a necklace display stand for a while. But these are expensive and not so cute always. 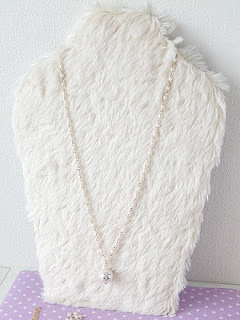 I always make cat motif accessories for necocoa Etsy shop, and imagined if fluffy snow white yeti girl (or guy (^_-)) wears these, it may be funny and cute.Then I remember the words... "if you can't find what you want, you can make that!" It is easier than Halloween Ghost Cat Charm. Cut the shape of neck stand out, trace the shape to faux-fur and back fabrics. 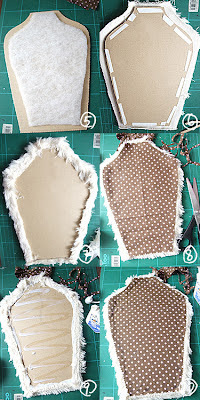 Cut the batting smaller than cardboard, and stick it by double-sided tape (check the pic no.5). 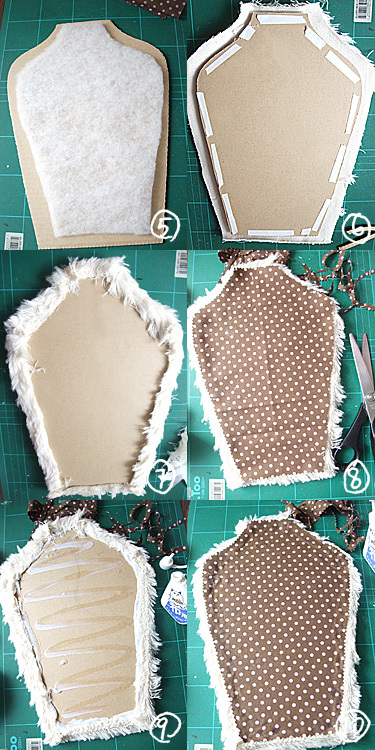 Then put faux-fur on there, turn it back, put double-sided tape around of cardboard to stick the faux-fur. 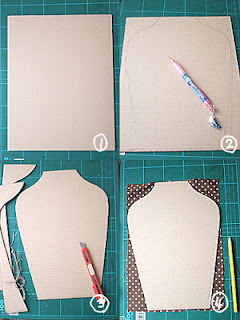 Back side fabric should be smaller, adjust size with pinking shears on cardboard. Put some superglue on cardboard, and stick the back fabric. Dry it 1 - 2 days. necocoa 2010. Simple theme. Powered by Blogger.